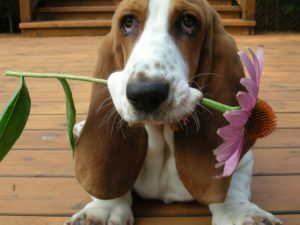 My new client Emily contacted me with two problems. One – she needed a landscape design for her new home that would be pleasing and fit her space and her style. She wanted to enjoy being outdoors in her small backyard in the summer. She knew she didn’t want lawn and she wanted entertaining space. She had a small terrace outside the kitchen door which is certainly big enough for a cuppa coffee, but it didn’t feel naturalistic and certainly wasn’t big enough to entertain. 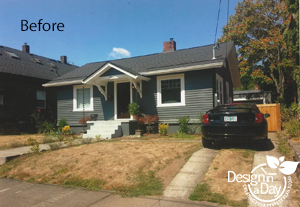 Two – no matter what sort of landscape design we did she would need regular landscape maintenance. In addition to finishing school, she spends a significant amount of time in France with family. Lots of people say they need low maintenance. Emily really needed low maintenance and a professional gardener who would not trim her Japanese maples into lollypops in her absence. Spring of 2016 Emily’s new landscape was overrun with weeds. When she called me late spring of 2016 her landscape was completely overrun with weeds, and her plants (recently planted fall of 2015) were struggling. Emily is an affectionado of minimalist design. Her ultra modern Westmoreland home is designed for renting out the bottom floor and she has a tenant. Emily loves ferns and Japanese maples. She prefers green leaves to the overly colorful variegated designer plants. She loves a woodsy naturalistic style for her plantings but wanted a minimalist modern style for any hardscaping. Three huge maple trees in neighboring landscapes created deep to dappled shade. In summer they took all the water and in winter they buried the landscape in pounds of wet mucky leaves. 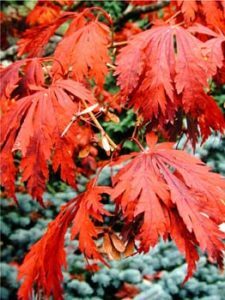 Fall clean up with Oregon Bigleaf maple starts in December. It is not the romantic vision of a person wearing a light sweater whistling and raking up dry pretty leaves. You’re wearing rain gear and using a shovel lifting up pounds and pounds of wet muck. Many plants would simply rot and die. I would need to carefully select plants that can survive being buried by such a deluge of leaves. This was a tough environment for plantings. Emily loves Japanese maples. We selected Acer Aconitifolium ‘Full Moon’ Japanese maple for her shaded backyard. On our design day we focused on the backyard. She had one window on the second floor (the kitchen window) and I selected a special Japanese maple, two king-size ferns and some small evergreen shrubs to see in winter. The Japanese maple has both a hot spring leaf color and strong red fall color. It was a lovely if obvious choice. Her downstairs tenant had an egress window so I kept the plantings low to keep all the available light. 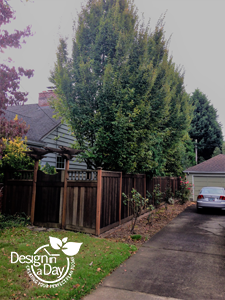 To create privacy between properties we used three small evergreen trees with tiny leaves to contrast with the Oregon Bigleaf maple. The rest of the plants were selected for summer interest because they would not be seen in the winter from the house. Brian of D & J Landscape Contractors placing HydraPressed concrete slabs for woodland modern garden. When I am designing a modern landscape, materials are everything. The new modern landscape design, which is actually not all that new anymore, can become a cliché of itself. Straight line paths without proportional balance look uninviting and cold. We used a warm gray HydraPressed concrete slab that is the epitome of modern style and will last forever if properly installed. We created two patio spaces and connected them with wide paths. It looks like one space with plants flowing in between. This is a lot of hardscape for a backyard so you might think it would look harsh. Plantings will cover every square inch of soil and create such a lush and full complement so that the patios are fully integrated visually. 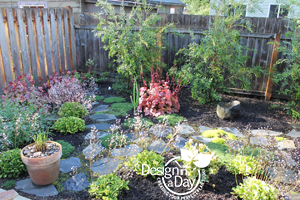 It’s a balancing act between hardscape and planted space. Another help toward a serene and simple look is the lack of lawn. Lawn, patio and plantings in such a narrow landscape wood tend to create a busy feeling and of course lawn would not thrive in such a shaded woodsy environment. It was important to honor Emily’s love of green leafed plants but in order to achieve the lushness needed to integrate the design, I had to find a way to provide a variety of textures (leaf shape, sheen, shade of green, habit of plant branches, etc.). My ideal for Emily’s garden is that you could take a picture of it with black-and-white film and it would still look incredibly beautiful because of the contrasting textures and varying shades of green. 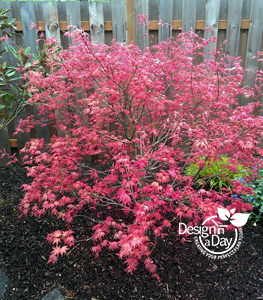 Because Emily loves Japanese maples she will have a succession of seasonal color changes to entertain her from spring to fall. The plantings we used are fairly low water once mature but it would be difficult to establish the plantings without irrigation because the huge Oregon Bigleaf maples roots will steal water from the new plants. With Emily’s school schedule and traveling, an irrigation system was necessary for long-term success. No one wants to saddle their tenant with the job of hand watering the landscape. August of 2016 was too hot to transplant Emily’s favorite maple. The contractor and I redesigned the hardscape layout so we could leave her existing maple undisturbed.